The Internal Revenue Service (IRS) announced that it will be ending the Offshore Voluntary Disclosure Program (OVDP) on September 28, 2018. Read the full announcement from the IRS here on the Boston Tax Attorney Blog. If you have an undisclosed foreign bank account, contact McMahon & Associates to learn how to come into compliance with the IRS. 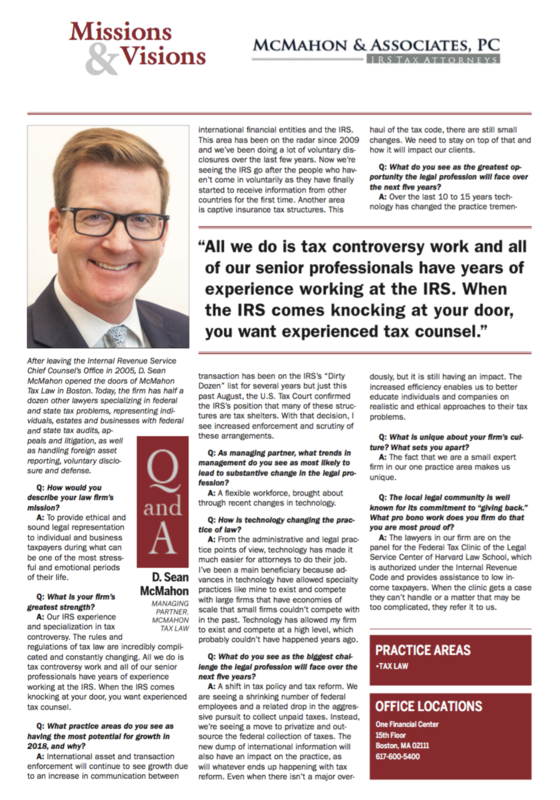 In a recent interview with Massachusetts Lawyers Weekly In House Counsel, D. Sean McMahon discusses trends in tax law, challenges to the legal profession and how McMahon & Associates assists taxpayers. After leaving the Internal Revenue Service Chief Counsel’s Office in 2005, D. Sean McMahon opened the doors of McMahon Tax Law in Boston. Today, the firm has half a dozen other lawyers specializing in federal and state tax problems, representing individuals, estates and businesses with federal and state tax audits, appeals and litigation, as well as handling foreign asset reporting, voluntary disclosure and defense. Q: How would you describe your law firm’s mission? A: To provide ethical and sound legal representation to individual and business taxpayers during what can be one of the most stressful and emotional periods of their life. Q: What is your firm’s greatest strength? A: Our IRS experience and specialization in tax controversy. The rules and regulations of tax law are incredibly complicated and constantly changing. All we do is tax controversy work and all of our senior professionals have years of experience working at the IRS. When the IRS comes knocking at your door, you want experienced tax counsel. Read Sean McMahon’s full interview here. Captive insurance tax shelters have been on the IRS’s “Dirty Dozen” list for the past several years and are on the IRS Large Business and International Division’s list of new tax compliance campaigns. In August 2017, the U.S. Tax Court ruled in favor of the Internal Revenue Service (IRS) in a case involving a microcaptive insurance company, Avrahami v. Commissioner, 149 T.C. No. 7 (2017), providing clear direction to the IRS to pursue additional cases. The Avrahamis, who owned several Arizona jewelry stores and shopping centers, set up a captive insurance company, with the guidance of their certified public accountant (CPA), an estate planning attorney and an attorney specializing in captive insurance. The company, Feedback, was incorporated in St. Kitts and and was treated as a small insurance company under IRS section 831(b). The Avrahamis also paid Pan America Reinsurance Company for terrorism risk insurance. The Avrahamis deducted the premiums paid and received a tax break by insuring itself for millions of dollars. The Tax Court ruled that payments made to the microcaptive insurance company were not for insurance and could not be deductible as insurance premium payments. In 2009 and 2010, the Avrahamis paid Feedback and Pan America a total of $2.2 million in insurance premiums. An IRS audit disallowed the insurance premiums paid to Feedback and Pan America. The Tax Court agreed. It found that Feedback did not meet the essential insurance characteristic of distributing risk and that Pan America was not a bona fide insurance company. You can read more about the Tax Court’s guidance on defining “insurance” in Avrahams on the Boston Tax Attorney blog. While the Avrahams case provides some additional guidance on captive insurance, it only addresses two of the commonly used criteria to determine if an arrangement constitutes “insurance”. Another pending captive insurance tax case, James L. Wilson & Vivien Wilson, et al., v. Commissioner, may address the other two issues and provide additional guidance for both taxpayers and the IRS. If your business is involved in a captive insurance company or considering a captive arrangement, McMahon & Associates can help you assess your captive insurance company to ensure that it is compliant with IRS regulations. If you should receive an audit notice from the IRS, we can help you navigate the examination process and appeals proceedings. his requirement to maintain auditable internal controls and to ensure accuracy and completeness creates a presumption on the side of the DOR that the POS system is accurate. Restaurants, especially, can run into issues during a Meals Tax audit where the auditor will assume that the numbers being reported in the POS system are accurate. Restaurants that use the POS system mostly for taking orders and sending the orders back to the kitchen to be prepared can end up artificially inflating their sales number in a variety of situations. For example, if a customer orders a pepperoni pizza, but it comes out with sausage, the server might reenter the pizza into the POS system so that the kitchen remakes the pizza. In my practice representing restaurants in Meal Tax audits, such issues are very common, and they can often inflate POS sales numbers substantially. Under audit, the DOR will start with a presumption that the POS system is accurate and that the sales reported in POS reports are the sales that should have been reported for Meals Tax (and income tax) purposes. However, if the merchant knows that the POS system is inflating sales and is inaccurate and uses a different method for calculating sales (such as, counting cash and credit card receipts), then the audit will result in an initial adjustment, that is often quite large. We have also seen the DOR begin to impose § 28 penalties, which is a penalty that is equal to the underreported tax, in addition to the § 35A 20% penalty. The DOR maintains that the §28 civil fraud 100% penalty is appropriate because the taxpayer is knowingly using a less accurate method of determining sales instead of using the POS sales reports. Even if a merchant is using an accurate non-POS method for determining its tax reporting, the DOR will start with a presumption that the POS system is accurate. Under audit it is important to advocate from the beginning that the POS system is knowingly inaccurate and that the merchant reported its taxes using another, accurate method. McMahon & Associates has experience with POS audits and can help guide you through the audit process and work to mitigate potential penalties. The Internal Revenue Service (IRS) will once again conduct in-person conferences for field office appeals if requested by a taxpayer. This change in policy was announced by Andrew Keyso Jr., acting deputy chief of the IRS Appeals at the recent American Bar Association tax section meeting in Austin, Texas and reported by Sony Kassam in Bloomberg BNA’s Daily Tax Reports. Kayso said adjustments and workforce realignment was needed before in-person conferences could be offered for campus cases, primarily underreporter cases, correspondence exam cases, and penalty appeals cases, will continue to be conducted by telephone conference. Taxpayers who have recently been through an IRS audit with complicated tax issues, or are facing an audit, should know that the exam is only the first step in resolving tax problems. Most complicated tax issues are not resolved during an audit. They are resolved in IRS Appeals or in Tax Court. “To resolve tax controversies, without litigation, on a basis which is fair and impartial to both the Government and the taxpayer in a manner that will enhance voluntary compliance and public confidence in the integrity and efficiency of the Service. All of McMahon & Associates’ senior tax attorneys and registered agents have either worked in or with the IRS Appeals Office during their tenure at the IRS. Our understanding of the rules and procedures of the IRS Appeals Office enables us to achieve the best possible settlement offer from the IRS before deciding if litigation is necessary. If you have a complicated tax problem, please contact McMahon & Associates to see if an appeal is the best option for you. Tax attorney D. Sean McMahon is speaking on the “Collection: New IRS Techniques and KEy Taxpayer Strategies” panel December 7, 2017 at the 2017 ABA 34th Annual National Institute on Criminal Tax Fraud and 7th Annual National Institute on Tax Controversy. The tax conference is an annual meeting of the American Bar Association’s criminal tax defense bar. The program brings together high-level government representatives, judges, corporate counsel, and private practitioners engaged in all aspects of tax controversy, tax litigation, and criminal tax prosecutions and defense. A team of attorneys from McMahon & Associates will attend the conference. McMahon & Associates is a Boston-based tax law firm. The lawyers represent individuals, estates, and businesses with federal and state tax controversies and disputes, including audits, appeals, litigation, and foreign transaction reporting. D. Sean McMahon, a Lecturer in Law, teaches a graduate-level class on Tax Practice and Procedures at Boston University School of Law. This is the third year Sean has taught the tax class at BU. The United States Court of Appeals for the First Circuit ruled in favor of McMahon & Associates’ client, Robyn Baker, in a tax dispute involving the division of assets in a divorce. The case is United States v. Scott G. Baker, Robyn Baker. The defendant, Scott G. Baker divorced his wife, Robyn Baker, in 2008 in order to fraudulently transfer assets and avoid some of his tax liability. The defendant owed more than $5 million dollars to the Internal Revenue Service (IRS) as a result of an agreed judgment in 2015. The government argued that its tax liens attached to the defendant’s assets and to some of Ms. Baker’s assets too. The government was not entitled to Ms. Baker’s half of the proceeds from the sale of the Hingham property and affirmed the district court’s ruling that the government had not submitted evidence sufficient to support a lien-tracing theory. It is not clear that the district court considered the fourteen factors required by Massachusetts law to arrive at an equitable division of the parties’ assets. Therefore, the division of the escrowed funds is vacated and remanded back to the district court to hear the case again. D. Sean McMahon, a Lecturer in Law, teaches a graduate-level class on Tax Practice and Procedures at Boston University School of Law. This is the second year Sean has taught the tax class at BU. Congratulations to D. Sean McMahon, Eric Rietveld and Elissa Burton on being named to the 2016 Massachusetts Super Lawyers and Rising Star lists. D. Sean McMahon has been named to the 2016 Massachusetts Super Lawyers list in the area of Tax for the fourth consecutive year. Sean McMahon is a former Senior Attorney with the IRS Office of Chief Counsel and a former Special Assistant United States Attorney for Massachusetts and New Hampshire where he was responsible for tax cases. Sean has more than ten years of experience investigating and defending IRS and state tax matters and excels at resolving difficult and complex tax disputes. Eric J.Rietveld has been named to the 2016 Massachusetts Rising Star list. Eric counsels clients with federal and state tax controversies. He received his Masters of Laws in Taxation from the Boston University School of Law and served as an intern for the Honorable F. Dennis Saylor IV in the United States District Court, District of Massachusetts. Elissa Sneider Burton has been named to the 2016 Massachusetts Rising Star list for the third consecutive year. Elissa represents individuals, estates and businesses before the Internal Revenue Service and Massachusetts Department of Revenue. She has a Masters of Laws in Taxation from the Georgetown University Law Center and served as an intern for Frank Scharaffa, Commissioner of the Massachusetts Appellate Tax Board. The Rising Stars list is developed using a patented multiphase selection process that includes peer evaluations and independent research. Rising Stars are either 40 years old or younger or have been in practice for less than 10 years. No more than 2.5% of eligible attorneys are named to the Rising Star list. The Boston-based law firm of McMahon & Associates is pleased to introduce their new tax dispute video series. The videos provide an opportunity for you to meet McMahon & Associates tax attorneys and IRS tax specialists and learn more about our approach to working with the IRS to resolve tax disputes. We are pleased to announce that Elissa Sneider Burton has recently joined the law firm of McMahon & Associates, PC. Elissa represents individuals, estates and businesses before the Internal Revenue Service (IRS) and Massachusetts Department of Revenue (DOR). She has a Masters of Laws in Taxation from the Georgetown University Law Center and served as an intern for Frank Scharaffa, Commissioner of the Massachusetts Appellate Tax Board. 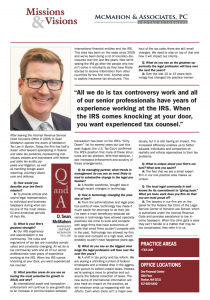 McMahon & Associates, PC specializes in representing individuals, estates and businesses in connection with federal and state tax matters including audits and examinations, tax litigation and appeals, submissions of offers in compromise, voluntary disclosures to the IRS, innocent spouse claims and more. The firm counsels and represents taxpayers in connection with the foreign bank [and investment] account reporting (FBAR) laws and regulations. Collectively, the firm’s attorneys, accountants and enrolled agents have more than 70 years of experience successfully representing clients in a wide range of complex federal and state tax matters. Elisa can be reached at 617.580.5030 or elissa@mcmahontaxlaw.com. D. Sean McMahon has been named to the 2015 Massachusetts Super Lawyers list in the area of Tax for the third consecutive year. Sean McMahon and his client won a resounding victory when a U.S. District Court Judge granted summary judgement dismissing the Government’s tax case and ordering the Government to pay Mr. McMahon’s legal fees. In United States of America v. Scott G. Baker and Robyn Baker, the Government sued Robyn Baker over a piece of property that she obtained from her husband in a divorce decree. U.S. District Judge Paul Barbadoro found that the Government’s tax case against Baker was not justified under Federal and New Hampshire law. The full order can be read here: McMahon NH Attorney Fee Decision 010815-1-1. D. Sean McMahon was named to the 2014 Massachusetts Super Lawyers List in the area of Tax law. This is the second year that Sean was named to the list. D. Sean McMahon was named to the 2013 Massachusetts Super Lawyers list in the area of tax law. Sean McMahon has more than 15 years of experience investigating and defending Internal Revenue Service (IRS) and state tax matters. He is a former Senior Attorney with the IRS Office of Chief Counsel and a former Special Assistant United States Attorney for Massachusetts and New Hampshire. Sean represents individuals, businesses and estates in tax controversy and litigation matters, including examinations, liability disputes, foreign bank accounts and FBAR requirements. Super Lawyers selections are made annually using a rigorous selection process, including evaluation by peers, professional achievements and third-party resreach. Only 5% of lawyers in Massachusetts were selected to the 2013 Super Lawyers list. The McMahon Law Office is pleased to announce that Internal Revenue Service veterans, Jeremiah O’Sullivan and Paul Reska have joined the firm. Together with D. Sean McMahon, the firm’s founder and former Senior Attorney with the IRS Office of Chief Counsel, the group has more than 70 years of experience working on IRS audits, examinations and appeals. “As the government continues to focus on revenue collection, I have seen a sharp increase in the demand for experienced professionals capable of handling difficult tax disputes. Jeremiah and Paul’s in-depth knowledge of the IRS audit and appeals processes allows me to grow the firm and assist more taxpayers,” said McMahon. Jeremiah O’Sulivan spent most of his 37-year career at the IRS working as a senior appeals officer. He also has 12 years of experience as a professor and tax instructor, where he taught hundreds of students, including some who are now responsible for conducting audits and appeals for the IRS. As an attorney with the McMahon Law Office, Jeremiah represents taxpayers with a full range of appeals before the IRS and Massachusetts Department of Revenue (DOR), including assisting taxpayers with evaluating their appeal options and negotiating settlements. Jeremiah is admitted to practice before the U.S. Tax Court, U.S. District Court for the District of Massachusetts and the First Circuit Court of Appeals. Paul Reska is an Enrolled Agent representing taxpayers before the IRS in audits, collections and appeals. As a 20-year veteran of the IRS, Paul has an in-depth knowledge of the organization and its processes and procedures. Paul assists individual taxpayers, estates and corporations with federal and state tax controversies, including audits and examination, Offers in Compromise and voluntary disclosures. The McMahon Law Office represents individuals, estates and businesses with federal and state tax controversies, including audits, appeals, litigation, and foreign transaction reporting. Collectively, the team of attorneys and enrolled agents has more than 70 years of experience investigating and defending IRS and state tax matters and excels at resolving difficult and complex tax disputes.